Hey can we go back to the plain background? That tiled plane is brutal for reading. Sorry to be a party pooper, but I agree. It’s playing havoc with my mobile. Me me too. But only until there’s an A6 there! Ok I guess I will survive it until then. If I must suffer, so must you! I guess I’m not sure what it’s all about. Is it not like that for everybody? On my phone I find it really distracting as the text kinda blends into the image. It’s bad on my computer too but it’s so much wider that it’s the periphery that annoys me. I can deal with the desktop version for a few days. The mobile is just killing me lol. Def not. I’ve got an f14b tiled down the page. I’m using the light theme. Yours is way less intrusive. I asked @fearlessfrog to swap out the image for a different one for the dark theme and that one is great and easy to read over. Come join the dark side! Not a major issue here for the launch. Added a couple of new themes that don’t use the Day of Tomcat celebration stuff, so please switch to those in your preferences until this goes away. The themes are called ‘Light But Dull But Clear’ for default colors, plus a dark theme version called ‘Dark But Dull But Clear’. EDIT: (Don’t laugh, but) How do I change the theme on mobile? It doesn’t seem to appear in the preferences section. 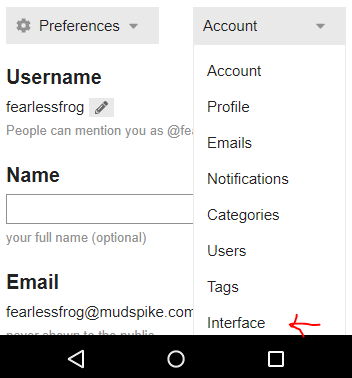 The tab selector on the right, ‘Interface’ should show the right page. 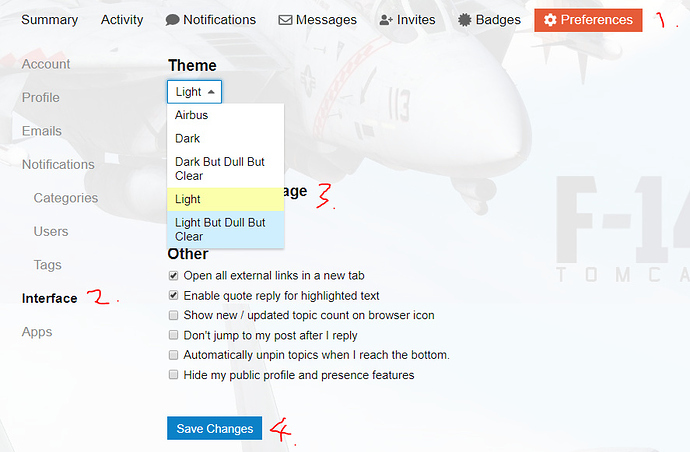 Once you switch it, don’t forget the blue ‘Save Changes’ button’ at the bottom of the page, as changing the setting will just show a preview but not save it automatically. Ever since the new background, when I hit Reply or Quote, it opens the editing windows, the typing cursor appears for a moment but then pops off. It puts me back into the main screen so that when I start typing it sends me to another page. Macbook Air, MacOS Mojave 10.14.3, Safari browser. But then I have to wear shades, at night!